And the situation is no different if I imported objects into FreeCAD and merged there - still 2 meshes and not watertight. So it looks like some sort of "artificial intelligence" is needed to combine meshes (merged Imagine object) into one watertight mesh. It appears that the relevant Imagine3D command would be 'Skin' - as in wrapping the merged objects inside one watertight skin. But when I try that I get message 'All objects must be identically structured and faceless'. So how does one make objects faceless? I think this might start to describe the problem to somebody with experience on the inner workings of a 3D program. Edit: is it a question of inside and outside faces? So the merging should merge all outside faces into one seamless surface area. I was able to use three primitives to make a simple object in Organica. When opened in AccuTrans3D the Organica object first had 269 meshes. After merging the meshes in AccuTrans the object was both watertight and one mesh only, thus 3D printable. I opened the object in AccuTrans3D and merged there. After merging it passed watertight check, but still had 17 meshes (printer software calls them shells). Whether this object might print correctly or not I could not tell because I do not have a printer (outsourcing the print jobs). 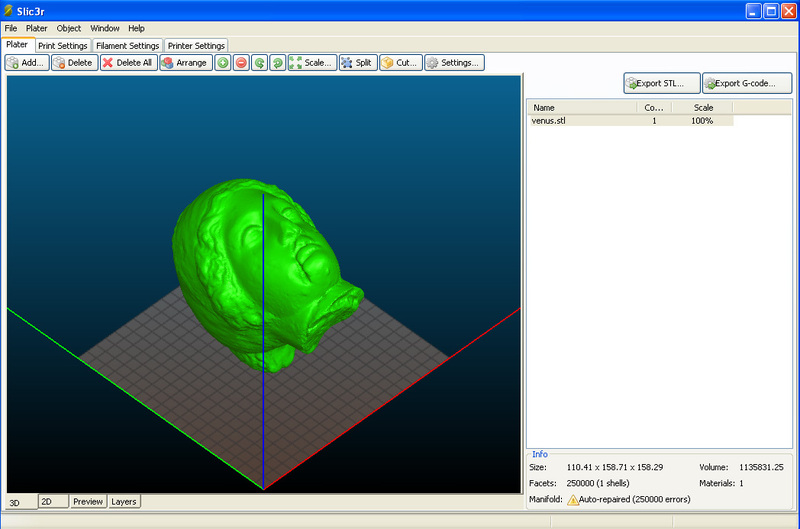 However, despite having more than one mesh it appears fine in the printer software. So the whole printing process requires looking into this meshes (shells) business to find out if and when it is acceptable for the object to have more than one to print correctly. It is my understanding at this point that CAD software outputs objects with just one mesh. It would certainly print, because it was watertight and had one shell (mesh) only. However, coke can was not watertight and had overlapping vertices (according to AccuTrans3D). So the objects downloaded from here vary in their ability to 3D print - needs more learning about what causes what. I have not done much 3D printing in a while, since it ties up my PC for very long periods. I have a Micro 3D printer, and with lots of experimentation here is what I've found. Firstly, you will go through a lot of filament (a.k.a. 3D Ink) and tie up your machine for days unless you split your object into several parts to glue together after they are printed. 3D printers not only use 3D ink to print the object itself, but they also use it to support the parts that would be suspended/floating if that was possible (perhaps aboard ISS). This requires planning. As an example, think about a simple cone. The fastest and most accurate print would be to rotate the cone in your printer software so that the largest flat side, the bottom of the cone, would be on the printer bed. In that configuration, the print would quickly and accurately be done with a minimum of 3D ink (and time) used to suspend the cone. However, you would have to check the object for holes prior to printing (i.e. 'watertight'). An Imagine Cone primitive gives you the option of adding faces to the widest part. And, most 3D printers require an object with no 'holes' (missing polys). Very complex objects such as the Antique Lamp you downloaded would be impossible for most printer software to print as a single object. You would have to split it up into it's various parts. The problem with splitting up a complex object is that you must keep the parts scaled correctly relative to each other. For me it was easiest to do that by splitting the object up into it's component pieces, then save each piece from Imagine with that piece's axis into he same XYZ coordinate as all the other pieces. Finally, here is an example of a simple object modified for a 3D printed object. A simple polygonal sphere primitive. One would think that it's a simple print job. But in fact the bottom half of the sphere would use time and filament to support the sphere. If I was faced with this problem I would split the sphere into two, then add polys to the two 'open' sides, then print the two halves at once. This way no filament is wasted. Finally I would glue the two halves together. Thanks a lot for the input. Yes, I understand the printing itself is art and science of its own. That is why I would like to understand the modeling part and leave printing to a specialist whenever possible. However, it may be impossible to learn what could print and what could not without having a printer available for test runs. I am currently testing and trying to learn a program called Open SCAD. This program produces solid 3D models that are 3D printable. Modeling is done using text based commands, so if anybody became familiar with Arexx with Amiga, 3D modeling with Open SCAD might be fairly easy to learn. Objects made in Open SCAD can be exported as STL files and after conversion can be opened in Imagine3D where they can be manipulated as usual and saved and imported back to Open SCAD. So basically what I would only need to learn is how to import parts of objects made in Imagine 3D into Open SCAD to do the merging and saving there - the result (if successful) should be a solid object for 3D printing.